kallisti vocal ensemble. With Maestro Steven Schick and the La Jolla Symphony for two performances of Luciano Berio's1968 masterwork for amplified vocal octet and symphony orchestra, Sinfonia. Performed by Kirsten Wiest, Lauren Jones, Hillary Jean Young, Barbara Byers, Bernardo Bermudez, Jonathan Nussman, Philip Larson and kallisti artistic director , Susan Narucki. Recital. With longtime collaborator, pianist Donald Berman in an evening of works for voice and piano. The concert's first half juxtaposes two works by György Kurtág: Three Old Inscriptions and Requiem for the Beloved with selections from Robert Schumann's Kerner Lieder, op. 35. Alexander Zemlinsky's Op 13, a set of six songs to poems by Maurice Maeterlinck and works by American composer James Primosch complete the program. Narucki and Berman have collaborated on a number of critically acclaimed recordings, including Song Cycles of Aaron Jay Kernis (Koch), Music From the American Academy in Rome (Bridge) and The Light That is Felt: Songs by Charles Ives (New World), for which they earned the Classical Recording Foundation's Samuel Sanders Award for Distinguished Collaboration. Soloist with orchestra. With conductor Teddy Abrams and the Louisville Symphony Orchestra selections from Sarah Kirkland Snider's song cycle Penelope and selections from Maestro Abrams’ forthcoming opera An Ali Portrait, about the life of the late Muhammad Ali. May 10, 12 & 13 2017 @ 7p.m. kallisti vocal ensemble. Stage director (Poulenc)/Producer. 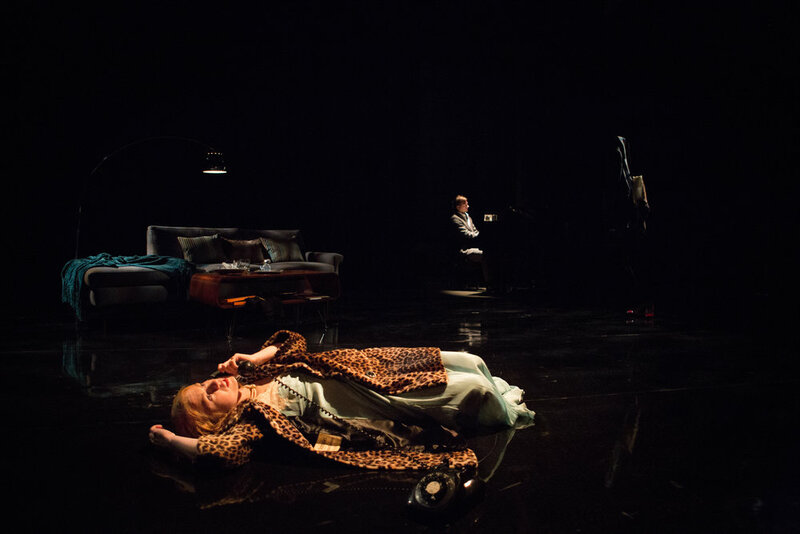 A double bill of Poulenc's La voix humaine, featuring soprano Hillary Jean Young and pianist Kyle Adam Blair and two rarely heard micro-operas by American minimalist Tom Johnson. Featuring kallisti: Kirsten Ashley Wiest, Lauren Jones, Jonathan Nussman. Artist residency. The creative team of Inheritance at the Leighton Artist's Colony at the Banff Center for the Arts to discuss and workshop aspects of the opera at a crucial stage of development. Recital. With longtime collaborator, pianist Donald Berman. “Stop Endings” juxtaposes two works by György Kurtág: Three Old Inscriptions and Requiem For the Beloved with selections from Robert Schumann's Kerner Lieder, op. 35. Alexander Zemlinsky's Op 13, a set of six songs to poems by Maurice Maeterlinck and works by American composer James Primosch complete the program. Vocal soloists with chamber ensemble. Celebrating the life and art of Grawmeyer award-winning composer Chinary Ung in Spiral XII, for vocal soloists and chamber orchestra. The performance will be led by American conductor Gil Rose and recorded for Bridge Records. Soloist with orchestra. With La Jolla Symphony and Chorus conducted by Steven Schick for a performance of Poulenc's Gloria.